Happy Thanksgiving friends! I have so very much to be thankful for, including of course you visiting with me in this space. I am forever grateful to you for reading my zany ideas and especially for the fact that you often like them! I just have a quick post for you today as it has been one whirlwind of a weekend. My baby sister got married yesterday! It was an incredible day, she looked beautiful, and we celebrated all night … so today, well – today I am a touch quieter than I generally am. Which brings me, of course to Quiet Bins! This cute turkey quiet bin is out of the Fall section of my book, A Year of Educational Quiet Bins. 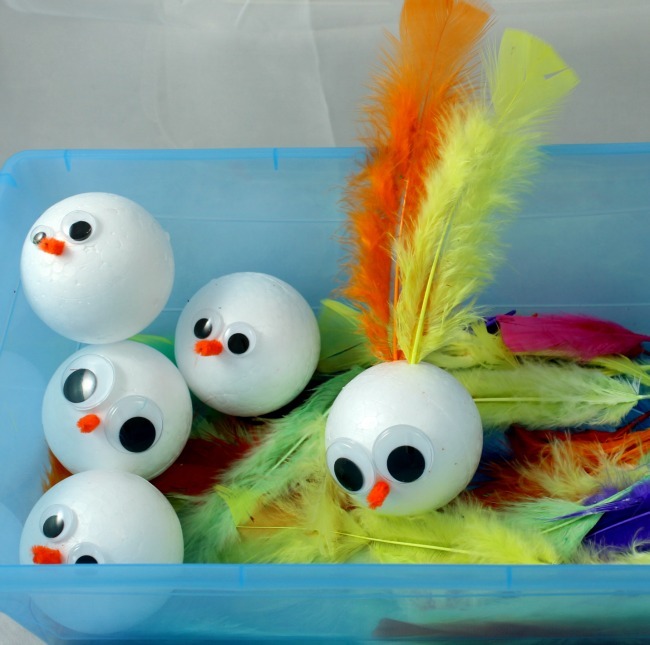 Some Styrofoam balls, a few googly eyes and something for a beak (I used orange pipecleaner) popped into a bin with oodles and oodles of feathers and you are set. Little ones can poke the feathers into the turkey to make pretty, colourful tail feathers. Fabulous fine motor proactice and super for strengthening little hands for future writing. And think of all the learning! Counting, patterning, and one-to-one correspondence are just a few of the awesome skills little ones will practice. Hope you are having a fantastic Monday friends! I am looking for ideas for simple projects for my 21 month old for the long snowy winter ahead. I am home with him often and am in need of some constructive activities for him since nap time seems to be a thing of the past. I have him at the table now doing the paper plate painting project, but he seems frustrated already since I won’t let him pour out all of the paint onto the table. I just came upon your site while thinking of things for him to do on this chilly dreary day. We will try as many as he allows. Hi Sarah! I would really recommend checking out my book – it is full, full, full of ideas that would be great for your little one! And they are all independent, so you might just get a moment or two to yourself! http://www.HowWeeLearn.com/my-book. You might also be interested in clicking on the “loads of ideas” tab above in the menu – there you will find lots of ideas for young toddlers! Thank you for reading!